We all have at least one guilty pleasure film that is so terrible, but we inexplicably love it. 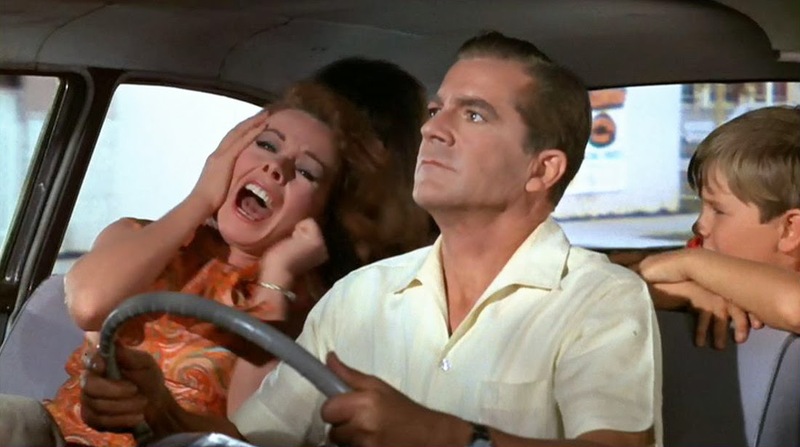 I have several, and one of them is the 1967 drama/thriller “Hot Rods to Hell.” It is one of those films where you laugh at the ridiculous lines and moments but have a desire to rewatch it constantly. 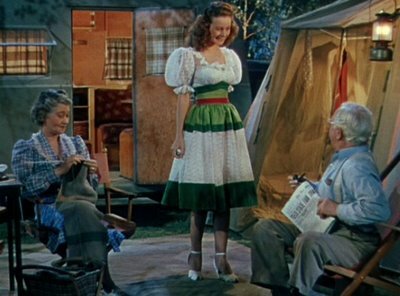 Originally made for TV but released in theaters, the camp film stars veteran Hollywood stars Jeanne Crain, as Peg Phillips, and Dana Andrews, as Tom Phillips. 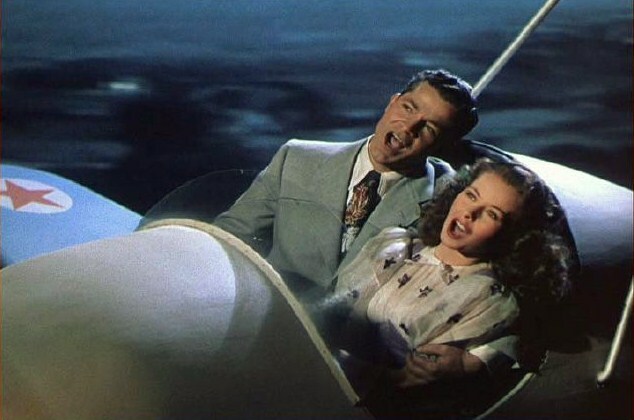 This is one of four films Andrews and Crain made together during their Hollywood careers that spanned the 1940s through the 1970s. 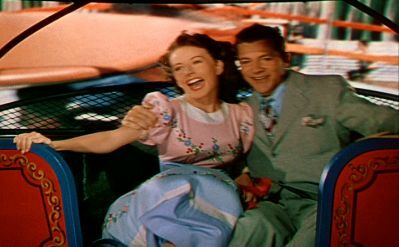 Their first film together was movie musical “State Fair” (1945) where Crain plays a farm girl named Margy who meets Andrews, a reporter named Pat, and falls in love with him at the state fair. “State Fair” ends with the two happily running towards each other and kissing in the street. I like to imagine that “Hot Rods to Hell” is Margy and Pat 22 years later with their children. The movie follows the couple and their two children Tina, played by Laurie Mock, and Jamie, played by Jeffrey Byron, as they move from their New England home to run a motel in California after Tom is in a serious wreck. The film begins with Tom driving home from a business trip to celebrate Christmas with his family. A reckless driver causes the accident and leaves Tom with a back problem and some mental issues. Due to the wreck, he no longer wants to drive and can’t listen to Christmas music. Tom’s brother arranges for the family to move to California to run the motel, believing it will benefit Tom’s physical and mental health. Drag racing teens running cars off the road: Ernie, Gloria and Duke played by Gene Kirkwood, Mimsy Farmer and Paul Bertoya. As the family is driving through the desert in their station wagon, they encounter teenagers drag racing a modified 1958 Chevrolet Corvette. “Run them off the road, Duke. Run them off the road,” shouts the teenage girl Gloria, played by Mimsy Farmer, as she is perched on the back of the car as they race. The teenagers are children of local, wealthy farmers who don’t care what the teens do. The teenagers have a constant thirst to get their “kicks” but nothing will satisfy them. Tina, who desperately wants to be a hip teenager, defends them by saying that all the kids drag race. 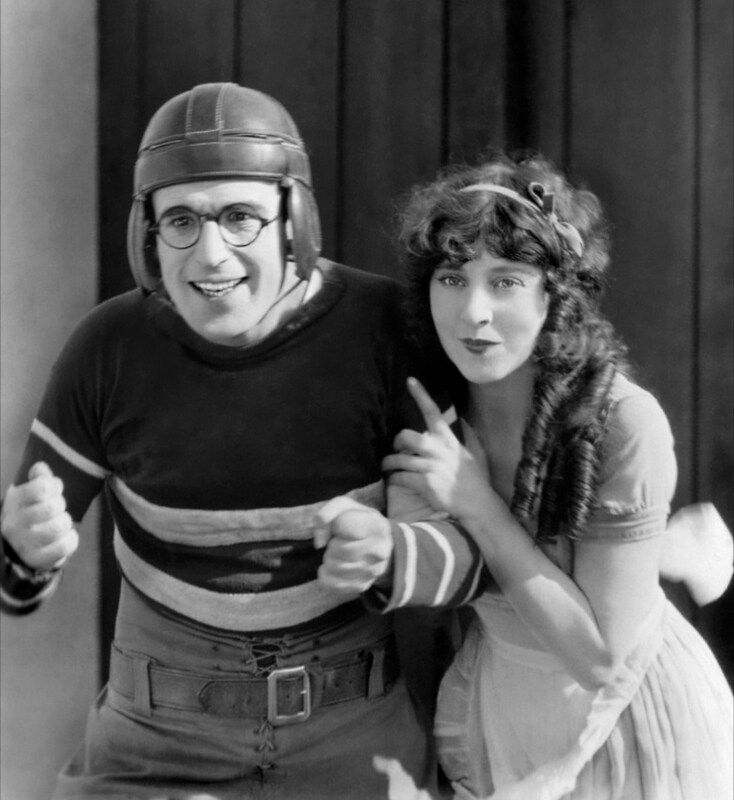 The majority of the 92 minute movie involves Duke, played by Paul Bertoya; Gloria and Ernie, played by Gene Kirkwood, harassing the Phillips family on the road. They tailgate the family through small towns, try to run them off the road and follow them to a picnic ground, where Duke attempts to seduce Tina. Tina is frightened but fascinated with the bad kids. When the Phillips finally arrives at the motel, rather than finding solace, there is more trouble. The motel and the adjacent a bar and grill are inhabited by the drag racers and other teens like them. The previous owner allowed the teenagers to drink and have trysts in the motel. It makes you wonder if Tom’s brother did any research on the spot before encouraging the Phillips to move there. When the drag racers discover the Phillips are the new owners, they do all they can to make them leave; knowing Tom will sanitize the spot. The family is terrorized by the drag racers. Frightened and disgusted with what they find, the Phillips decide to stay the night at the hotel before figuring out what their next move should be. Jealous Gloria tells Tom and who tries to strangle Duke. The family leaves the hotel to get the police, and the drag racers continue to follow the Phillips family. After even more harassment, Tom finally and successfully stands up to Duke and Ernie. Tom places his car in the middle of the road in a game of “chicken” and the family hides. Duke and Ernie swerves to miss the car and crashes. The crash causes an immediate attitude change and the boys tell Tom they won’t give him anymore trouble. The film ends with Tom deciding to go back and run the motel properly. “Hot Rods to Hell” is truly a terrible movie, but I can’t get enough of it. Duke tries to seduce Tina, played by Laurie Mock. The hilarious lines and the over reacting to the situations make it a true guilty pleasure and cult classic. But at the same time, it’s sort of sad. To see 1940s and 1950s stars Dana Andrews and Jeanne Crain late in their career and performing in this type of film is disheartening. Crain was a top star at 20th Century Fox in the 1940s and 1950s and was nominated for an Academy Award for Best Actress for her role in “Pinky” (1949). Dana Andrews previously starred in top notch films such as the noir “Laura” (1944) and the post-war drama “The Best Years of Our Lives” (1946). While the old glamorous and glittering Golden Era of film was fading, the top stars were retiring or resorting to cult films like this one to continue to make money. To compare, Joan Crawford was killing people with an ax in “STRAIT-JACKET” (1964) and Lana Turner was drugged with LSD in “The Big Cube” (1969). While I marvel at the beautiful films in the early careers of these stars, I also can’t get enough of their late careers. Classic Hollywood’s career downturns have turned into our guilty pleasures. Set in Philadelphia during the United State’s centennial celebration in 1876, the plot focuses on the Rogers family. Their Aunt Zenia (Bennett) comes to visit from Paris, France for the celebration and brings her French nephew Philippe (Wilde). The oldest Rogers sisters Edith (Darnell)-the flirty older sister who gets all the boys- and Julia (Craine)-the more quiet sister who has never had a romance- immediately both are enchanted by the Frenchman. The two both work for his affections. 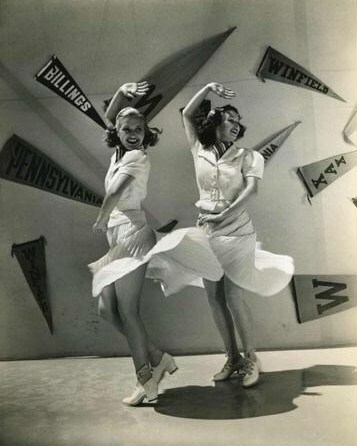 -The film was Fox’s response to MGM’s hit “Meet Me In St. Louis” (1944). Both films focus on turn of the century nostalgia. -Very few of the actors do their own singing. Crain was dubbed by Louanne Hogan (who also dubbed Crain in “State Fair“) and Darnell was dubbed by Kay St. Germain Wells (who also dubbed Darnell in “Hangover Square“). 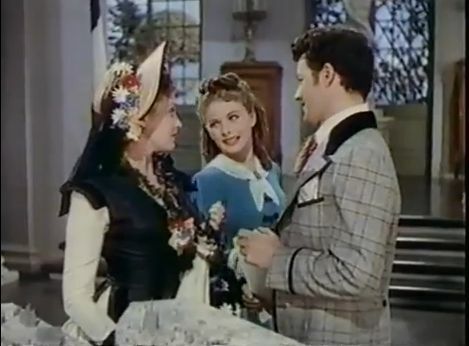 Edith (Darnell) and Julia (Craine) compete for the attentions of Phillippe (Wilde). Comet Over Hollywood/ Screencap by Jessica P.
-The vibrant, Technicolor sets and costumes make this film. -The movie includes items that were introduced during this time period such as a magic lantern show. -Cornel Wilde carrying two dachshunds as he gets off the train….only because I’m a dachshund owner. -I love the large cast ranging from silent film star Dorothy Gish, pre-code queen Constance Bennett to fresh faced Jeanne Craine. For Jerome Kern’s last work before his 1945 death, none of the songs in this film were memorable. Many of them seemed misplaced. 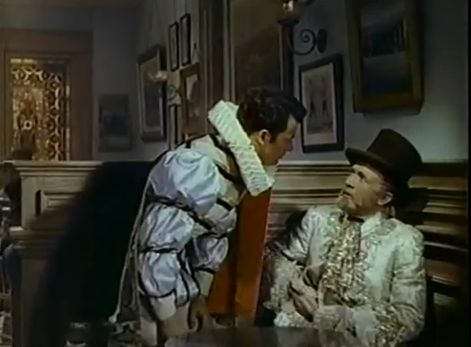 For example: Philppe (Wilde) and Jesse (Brennan) were about to have a serious conversation in a saloon about Julia (Craine) when African-American singer Avon Long enters the saloon and starts singing “Cinderella Sue.” Though the song was probably one of the more entertaining tunes in the film, it cut right into the middle of a scene. Why would they do that? Philippe and Jesse look ridiculous dressed in French costumes (after a masquerade) in a saloon. Comet Over Hollywood/Screen Cap by Jessica P.
This is actually one movie I wish was not a musical. Don’t get me wrong, I loved the cast and the story line and thoroughly enjoyed watching it. But right as the plot was moving right along, it would come to a grinding halt with a misplaced, forgettable song. It’s very obvious that this was 20th Century Fox trying their hand at a turn-of-the-century family stories since Metro-Goldwyn-Mayer had so much success with “Meet Me in St. Louis” (1944). However, “Centennial” is more frustrating than heartwarming. 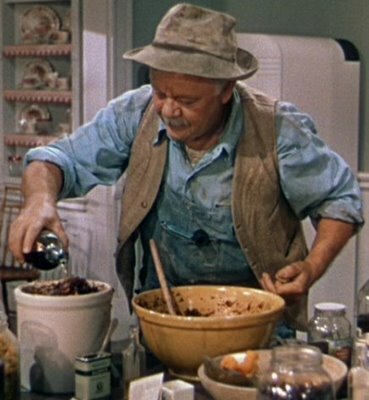 All of the actors did a wonderful job, particularly Jeanne Crain who has always been a favorite of mine. However, Cornel Wilde’s French accent sounded more like a Charles Boyer impression. 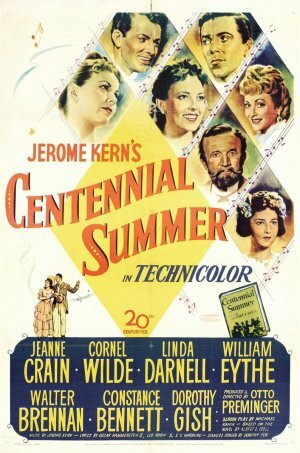 “Centennial Summer” is a film I have searched for and wanted to see for years. Thank you to our friends over at Laura’s Miscellaneous Musings for letting me know it is currently up on Youtube and contributing to an enjoyable afternoon. Set in 1929, teenager Peggy Mayhew (Crain) falls in love popular bandleader Chuck Arnold (Dailey). She spontaneously kisses him on stage after winning a prize. Chuck asks to see Peggy again. When she travels to the next town to see his band, they elope. Peggy has to adapt to life on the road with musicians. The couple then struggles with their careers and their relationship when the stock market crashes. -Marilyn Monroe had an uncredited role that ended up being cut from the film. -Though Dan Dailey had been in films for eight years, this film was around the time his career was starting to take off. -The first 20 or 30 minutes is very similar to “Orchestra Wives” (1942). Crain falls in love with a bandleader, travels to see him and they elope. Ann Rutherford does the same thing in “Orchestra Wives.” Once the couple elopes in the film, the similarities end there. 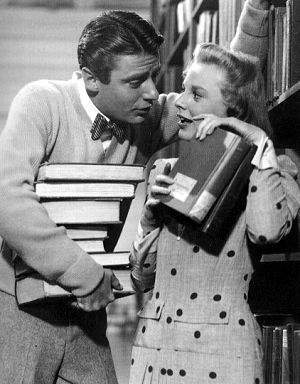 -Jeanne Crain and Dan Dailey do a cute song and dance routine to “Ain’t She Sweet” while in a soda shop. -Dan Dailey tap dancing to “Crazy Rhyme.” Though Dailey isn’t the greatest tap dancer of the 1940s and 1950s, he does a great job. -Small role of Barbara Lawrence. Though she isn’t in the film very much, she is still delightful to see. “You Were Meant for Me” isn’t an award winning film, but it’s light-hearted and fun. 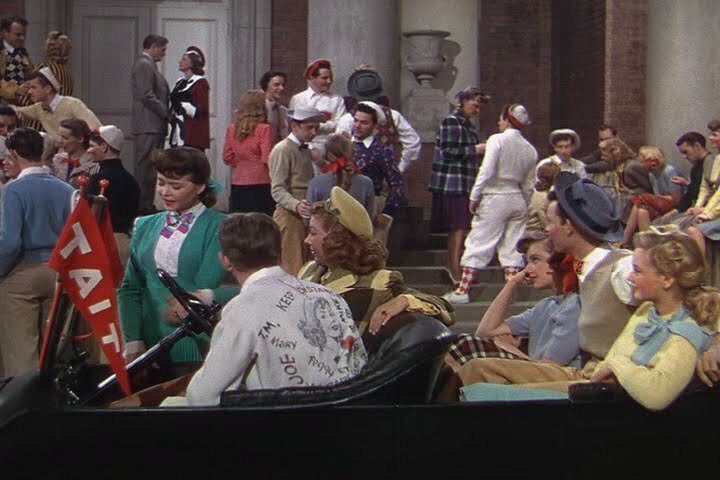 The musical performances in the film are mainly by Dan Dailey on stage, rather than spontaneous songs and dances brought on by emotion from the character. The film is in black and white, which isn’t a problem for classic film fans, but shows the 20th Century Fox didn’t see it as an important musical-though it starred two of their top stars. 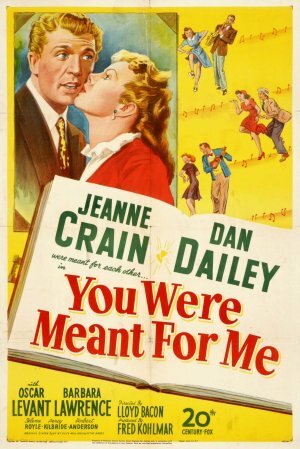 Crain and Dailey make a good pair and I wish they had been in more films together. Dailey is an underrated actor and does an excellent job with singing in dancing in this film. His voice is mellow and soothing and his tap dancing is believable. My only complaint is that the film ends rather abruptly. Otherwise, it’s an enjoyable film that I highly suggest. This is part of the 2nd Annual Birthday mini-blogathon, sharing my favorite movies leading up to my birthday week. 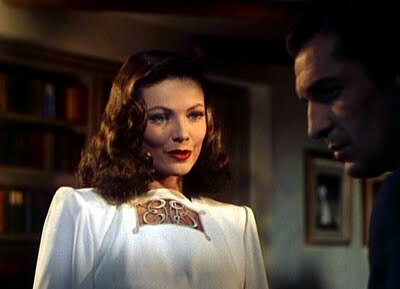 Ellen (Gene Tierney) during the climax of the movie. Starring: Gene Tierney as Ellen, Cornel Wilde as Richard, Jeanne Crain as Ellen’s sister Ruth, Vincent Price as Ellen’s jilted lover Russell, Chill Wills as Richard’s handyman Leick, Darryl Hickman as Danny, Richard’s brother. 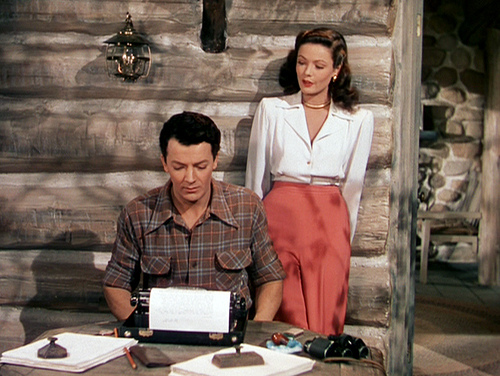 Brief Plot: Writer Richard Harland (Cornel Wilde) meets Ellen Berent (Gene Tierney) on a train to New Mexico. The two fall in love and are quickly engaged. Ellen behaves strangely and possessive, which her mother says is a result of her “loving too much.” Ellen’s love destroys several people around her, including herself. 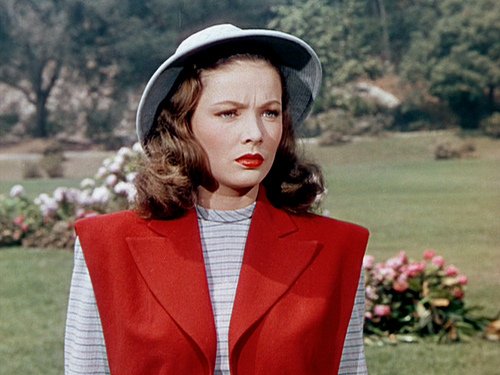 Why I love it: Not only does Gene Tierney look her most beautiful in this color film but also gives a powerful performance. 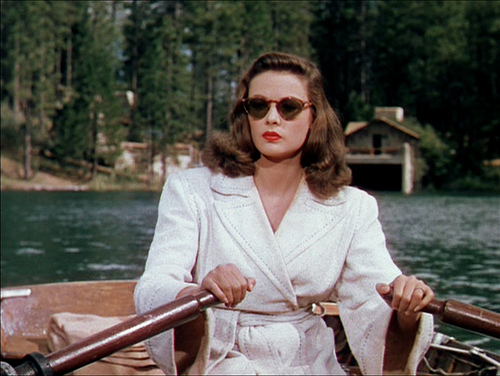 Set against a lush backdrop of Bass Lake, California, New Mexico and the Boston sea side, “Leave Her to Heaven” is eye candy with settings as well as Tierney’s fashion. For a first time viewer, this film seems like an innocent romance but twists almost into a suspense film. Ellen’s reaction when she finds out Danny may live with her and Richard. Gene Tierney’s performance (SPOILERS): I was shocked Gene Tierney didn’t win the Academy Award for this performance, but when I saw Joan Crawford won the Oscar for “Mildred Pierce,” I understood a little more. Tierney transforms from a seemingly normal woman at the beginning of the movie to possessive and psychotic. Well dressed and wealthy, Ellen just seems like a spoiled socialite who is used to getting her way, but it is more than that. The couple visit Richard’s brother, Danny, who is in a polio clinic. As Danny’s health improves, Richard wants to take Danny to his lakeside cabin called Back of the Moon. When Richard says, “Now all three of us can move to the Back of the Moon,” Ellen’s look of alarm and anger about Danny invading their home foreshadows trouble. After the three move to Back of the Moon, Ellen is angry that she and Richard are never alone and hates the book he’s working on. We see how insane Ellen’s obsession is at the climax of the film. From this moment, Tierney goes into a downward spiral ruining the lives of her sister, husband, mother and unborn child. Ellen jealous of Richard’s book because it takes up all his time. Fashion: Ellen’s wardrobe is one of my favorite parts of the movie. Her outfits almost seem to reflect her character. Ellen and Ruth’s outfits show the contrast in their characters. Several of her outfits at the beginning are white. When we first see her on the train she is in a white dress with gold jewelry with a white fur coat and turban. 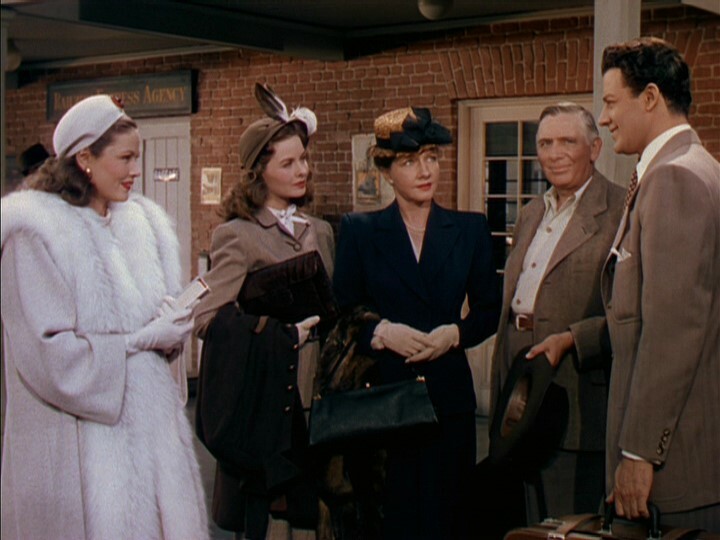 Her glamorous outfit contrasts with Ruth’s simple brown suit, showing the difference between the two girls. Ellen’s glamorous, monogrammed white one-piece outfit. Ellen then wears a white one piece suit with her initials monogrammed on the chest. As the most progresses, we see her dressed in several green outfits. A green bathing suit, a green suit. She is even wearing green maternity clothes, as she is distressed and unhappy with the pregnancy. The green may reflect her jealousy of everyone who is taking up Richard’s time. This concludes Day 1 of Birthday Blogathon Week. Please stop by again tomorrow for another favorite film of mine!